BB King, dead at 89: Remembering Live at the Regal’s three-song medley, the greatest 12 minutes of live musical performance ever recorded. The three-song medley at the heart of his masterpiece may be the best 12 minutes of live musical performance ever recorded. B.B. King performs in Germany in 1971. “B. B. King, Audimax Uni Hamburg, November 1971 (Heinrich Klaffs Collection 56)” by Heinrich Klaffs. Licensed under CC BY-SA 1.0 via Wikimedia Commons. B.B. King, a titan of American music who died Thursday at 89 years old, lived for so long, did so much, and was so deeply woven into our cultural fabric that it was easy to take him for granted. “The King of the Blues,” he was called, although too often in the offhanded and unthinking tone in which people call Budweiser the King of Beers. King was a singer and guitar player of unfathomable depth and dimension, and his music was a watershed: In the middle part of the 20th century, no performer so effortlessly melded country blues to the more urban, “modern” sounds of post–World War II rhythm and blues than King: not Muddy Waters, not Howlin’ Wolf, not the still-missed Bobby “Blue” Bland. Already on his first major hit, 1951’s “3 O’Clock Blues,” King exemplified this fusion in spades: the urbane and jazz-inflected guitar playing, the lush and billowing horns, the vocal performance that seems to channel Lonnie Johnson and Blind Lemon Jefferson out of one lung, Jimmy Rushing and Frank Sinatra out of the other. Writing about 89-plus years of B.B. King’s life quickly starts to feel like writing a history of American pop music itself—he spent his boyhood picking cotton in the Mississippi Delta and his twilight years as a capitalized National Treasure, a living metonym for the blues. So instead I will write about a scant 12 minutes of B.B. King’s life, the three-song medley of “Sweet Little Angel,” “It’s My Own Fault,” and “How Blue Can You Get?” that sprawls over the first side of King’s masterpiece, Live at the Regal. This medley is, in my completely subjective and admittedly grief-stricken opinion, the greatest 12 minutes of live musical performance ever recorded. It should be mandatory listening today, and for everyone of every generation to come. Live at the Regal, recorded at Chicago’s Regal Theater in 1964 and released in 1965, kicks off, first, with a blisteringly fast rendition of “Every Day I Have the Blues.” The dust settles and the crowd is already convulsing; the band starts noodling behind B.B., who announces his intention to go back and “pick up some of the real old blues. If we should happen to play one that you remember, let us know it by making some noise.” Noise shall soon be made. King was 39 when he recorded Live at the Regal—not exactly a spring chicken, but he was at the apex of his abilities as a singer. His control on “Sweet Little Angel” is virtuosic, shifting from gospel belt to sultry croon to his swooping, heavenly falsetto. His voice quivers, growls, thrills, teeters on the brink of combustion. “Sweet Little Angel” is a song of tribute and awed devotion—“I asked my baby for a nickel/ and she gave me a $20 bill”—until we hit the last verse. “If my baby quit me, I do believe I would die/ If you don’t love me, little angel/ Please tell me the reason why.” A plot-twist ending: It’s a goddamn breakup song. And right as the realization hits, the guitar solo comes in, and the whole world falls away. 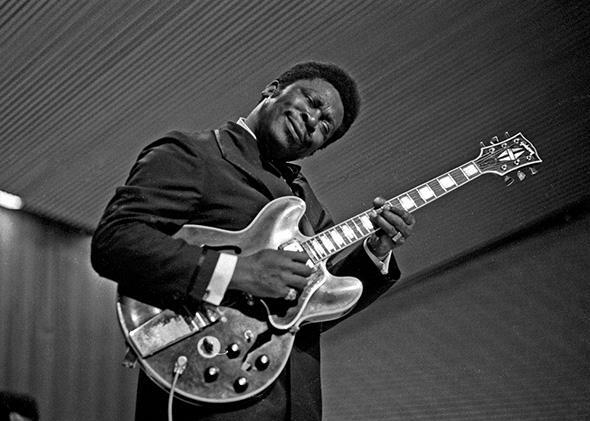 No one has ever played electric guitar quite like B.B. King—what he lacked in technical chops he made up for with gifts of melody, phrasing, and cerebral precision that, among improvisational soloists, place him in the company of Miles Davis and no one else. The solo coming out of “Sweet Little Angel” is a masterpiece of tone, range, and above all restraint. The spaces between King’s phrases are as thrilling as the phrases themselves; he lingers and sustains where a less assured musician would dash to the next idea; his mastery of dynamics is so complete that each string seems to have its own voice, and its own breath. Every note is perfect from the moment it appears to the moment it recedes. But good Lord, does B.B. sell this one. “How Blue Can You Get?” on Live at the Regal is pure incendiary ecstasy, all the way through to its shattering, stop-time climax. Everyone in this club knows this song; everyone in this club is reacting as though it is being written on the spot. When we reach the song’s applause line—“I gave you seven children/ and now you want to give them back” (God, who says this to someone?)—B.B. leans into “gaaave” with such force it seems to upend the whole building. “How Blue Can You Get?” doesn’t end so much as collapse into a heap of exhaustion. The crowd goes berserk, the only conceivable response to 12 minutes of music that does just about everything one could ever hope music to do. John Lennon once described the blues as “a chair, not a design for a chair or a better chair. … You sit on that music.” Somewhere right now B.B. King is sitting on that chair, like a throne.